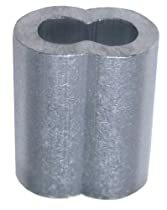 Feature with single hole.Sleeves, when properly applied, are capable of holding the rated breaking strength of the cable to which they are applied. However, to determine the exact holding strength, we recommend pull testing prior to use. This step ensures the proper selection of materials, the correct pressing procedure and an adequate margin of safety for the intended use. 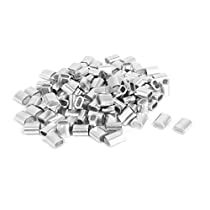 Fit for Steel Wire Rope Diameter: 2mm/5/64"
Loos Cableware SL1-2 Aluminum Duplex Oval Crimping Sleeve Set for 1/16" Diameter Wire Rope (50 Piece) - Loos & Co.